Ever since last semester either Jarod or Harley tagged me a Chinese performing Canon in Dizi, I was impressed by his skills and would like to perform this piece too. This piece can be beautifully performed solo by violin, piano and flute as far as I heard from YouTube. I searched a few versions of the score in the net and translated one of them so that I could perform using Dizi. For the past few weeks I've been translating part of the score, I also tried to perform it using Dizi. Though it might sounds weird as the original piece is performed using western instruments performing using chinese instrument, but it gives you another sensation to enjoy Canon in a different view. Of course I'm not gonna post the video of me performing the song, but here is the video that shows the Chinese guy performing Canon in Dizi. And by the way, my practice on Canon for the past few weeks had some influence on my neighbour next door. I knew someone do learn piano next door as I always heard some songs being played. But lately I'm been listening to Canon being played ! Of course it sounds perfect for piano, but still, both of us are not the master of this piece and needs more practice. Practice makes perfect huh ? Kinda... I guess. Sensei said that I should blog more... or more accurately "blog everyday". But actually I'm not sure what can I blog so I could "blog everyday". I couldnt blog about my internship too much, as it might bores you. I couldnt blog about other stuffs, as I need Internet for the information and pictures. I also couldnt blog about myself too much, as I would like to keep some privacy. There's no events happening lately unless you count the leave that I took yesterday, so there's really nothing much I could blog unless, of course, those emo blog post ! To express the emo-ness, I would like to use Chinese. But I've been using too much Chinese lately, whether is in the office or SMS-ing. And my English is getting rusty, I would like to have a book to sharpen up my English !!! Talking about books, I gonna be mad !!! I want my copy of Lost Symbol !!! Everytime I pass by MPH I'll take a copy of the book and look at the price tag, then I'll simply start browsing the book. Whenever I looked at those pages with puzzles, pictures and illustrations, I will think that "this is gonna be a great book with Robert back in action again". For your information, this book will be adapted into a movie for a 2012 release as expected, and Ton Hanks will reprise his role as the famous Prof. Langdon again to solve the mystery of symbols. Thanks "My" Chelle for the book, I'm not sure whether you're reading it now or not, but I'm sure that I'll get it from you when we meet again in Kampar. The Dark Lord has returned, and now everyone in the magical world starts to afraid about it. At the same time, the Death Eaters also infiltrated the Ministry of Magic, and Snape is appointed as the headmaster of Hogwards school of witchcraft and wizardry. 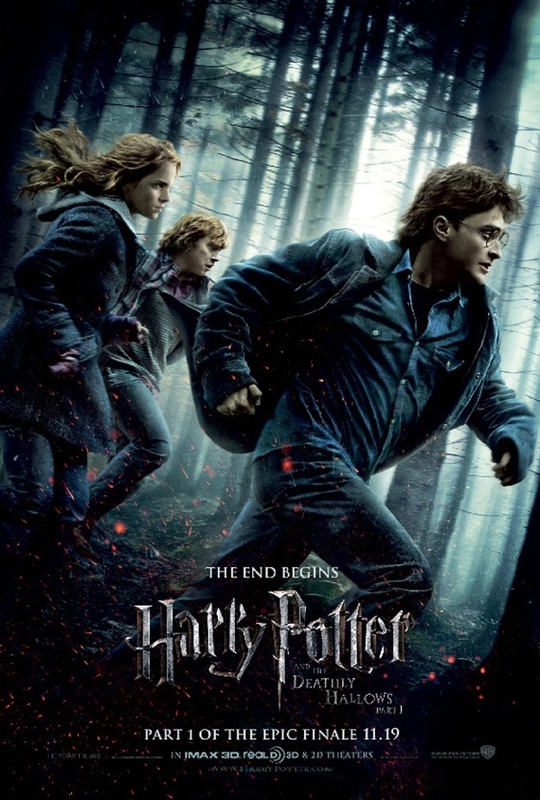 In order to avoid being caught by the Death Eaters, Harry, Ron and Hermione took the items given to them through Dumbledore's will and set on a journey to destroy the Horcruxes and ultimately Lord Voldermot himself. Will love break their friendships ? Will disappointment break their hopes ? Will trust break their defences ? From the opening till the end of the movie, I'm keeping track of the scenes and chapters as written in the book. And surprises me, I didnt sense any "gaps" between scenes in the movie. The movie's plot went on smoothly, every second on the movie is very tense. The funny thing is the small bag the Hermione took with her. She casted a spell on it (from the book: I remembered its actually a gift from Hagrid if not mistaken) and the storage space is extended. Other than books, clothes, potion flasks... she even stuffed a small tent inside too ! And of course, the tent was extended too, so it could fit 3 of them inside. "Obliviate." Hermione casted a spell to erase her parent's memory. "Nagini, dinner..." said Lord Voldermot to his pet. "Kreacher, find Mundungus," Harry ordered his housekeeper elf. Also not forgetting the "7 Potter" scene, the wedding and "getting flushed into the Ministry of Magic". A 10 out of 10 would be good. Highly praising the "7 Potter" scene, scenes inside the Ministry of Magic, Hermione narrating Beedle the Bard's - The Tale of the Three Brothers and "Malfoy's Manon". Thats the first thing I thought of while thinking of a title for the day. Doesnt matter what it suppose to meant in the end... Anyway, I've noticed that I've updated my blog less frequent than last month, so I'm here, updating my blog. So much to tell, so much to say... but, I just dont feel like writing it out here. Waiting for 24th November... to come.